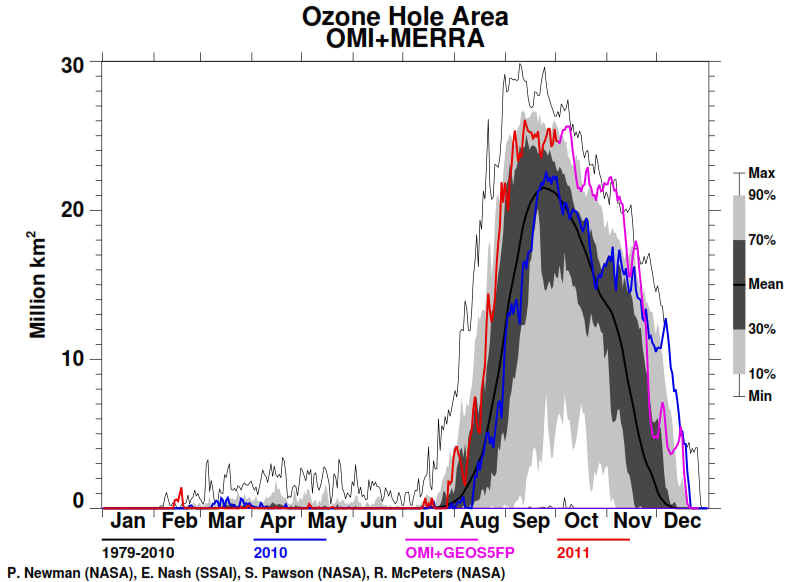 The 2011 Antarctic ozone hole is over, with the weak summer circulation now established. The hole began to form in mid August, and by mid September had reached an area of around 25 million square kilometres, larger than the average for the last decade and remained near this size into early October. It had shrunk to around 20 million square kilometres by mid October and remained a similar size till mid November, when its size dropped rapidly but remained at a few million square kilometres until mid December. It filled by the summer solstice. Its size from October to mid November was near to or above the record area for the time of year. The hole became more elliptical in mid October and the edge of the ozone hole passed over the tip of South America and the Falkland Islands, but then returned to a more circular form. Minimum ozone values are currently around 250 DU. Maximum values are near 340 DU, but they are subsiding from peaks above 400 DU. The lower stratospheric temperature is near its summer peak, though temperatures remain below the normal for this time of year. The edge of the ozone hole passed over the tip of South America around September 26 to 28, October 9, 16 to 19. The edge again passed over this area from November 7 to 8. Significant differences between the various satellite analyses of ozone distribution remain. Although the amount of ozone destroying substances in the atmosphere is going down, the inter-annual variation in the size and depth of the ozone hole is largely controlled by the meteorological conditions in the stratosphere. This year the polar vortex was cold and stable, allowing substantial ozone depletion. It is still too soon to say that we have had the worst ever ozone hole. 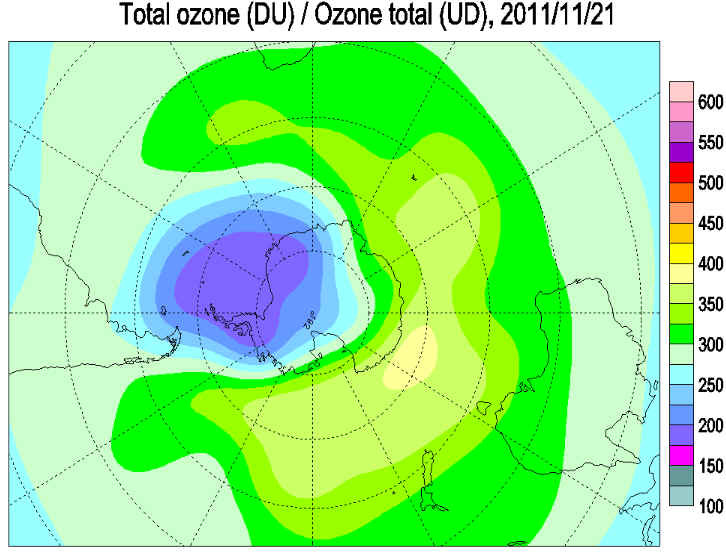 There was substantial Arctic ozone depletion over the northern winter in 2011. As 2012 approaches, the northern circulation pattern is returning to the winter mode, with some parts of the lower stratosphere already below the PSC formation temperature. The minimum temperatures are close to the seasonal extreme. Arctic ozone levels are within 30% of normal, with areas that are higher and lower than the mean. 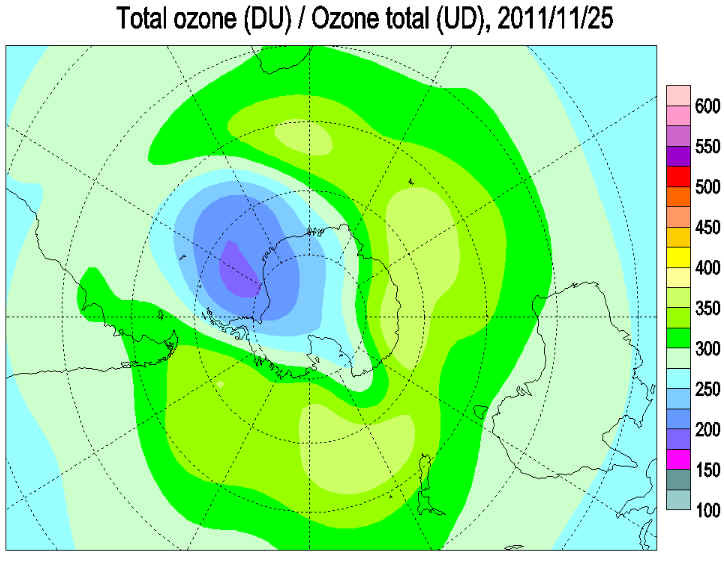 The ozone hole area is determined from total ozone satellite measurements. It is defined to be that region of ozone values below 220 Dobson Units (DU) located south of 40°S. Values below 220 DU represent anthropogenic ozone losses over Antarctica. 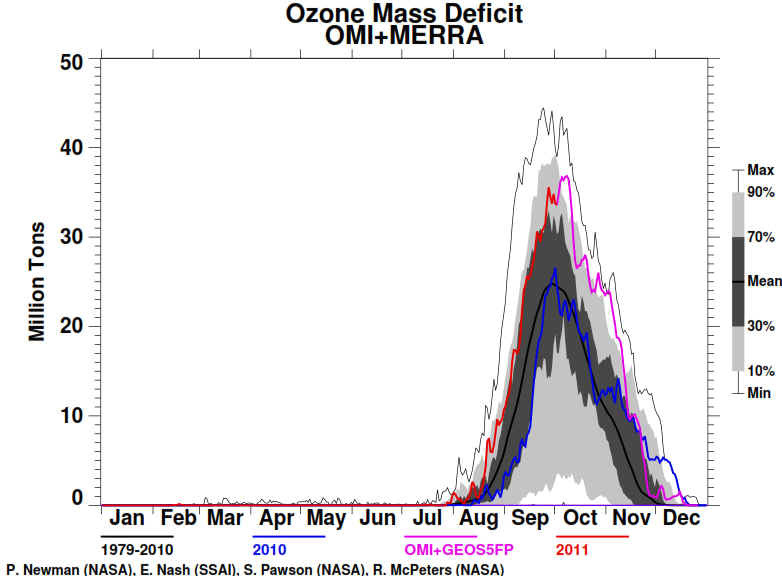 The ozone mass deficit is determined from total ozone satellite measurements. It combines the effects of changes in area and depth. It is the total amount of mass that is deficit relative to the amount of mass present for a value of 220 Dobson Units (DU). Time series of the volume of the region where temperatures are low enough for the formation of nitric acid trihydrate (NAT or PSCs of type I). The red curve shows 2011 (until 2 December). The blue and green curves represent 2010 and 2009, respectively. The average of the 1979-2010 period is shown for comparison in black. 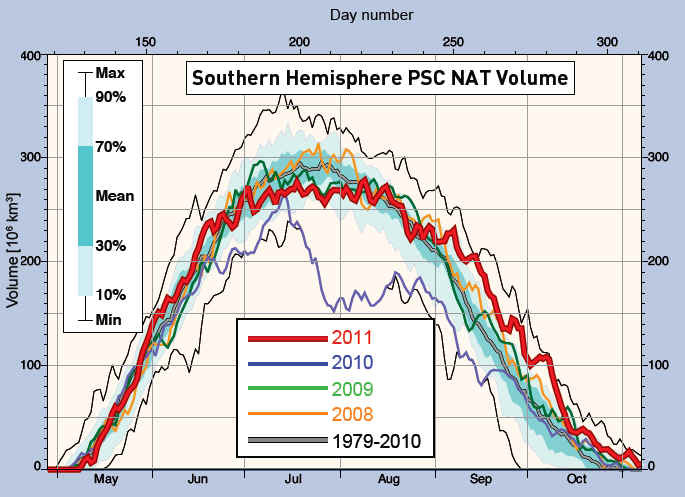 The two thin black lines show the maximum and minimum PSC area during the 1979-2010 time period for each date. The light blue-green shaded area represents the 10th and 90th percentile values and the dark blue-green shaded area the 30th and 70th percentiles. The plot is made at WMO based on data downloaded from the Ozonewatch web site at NASA, which are based on data from NOAA/NCEP. 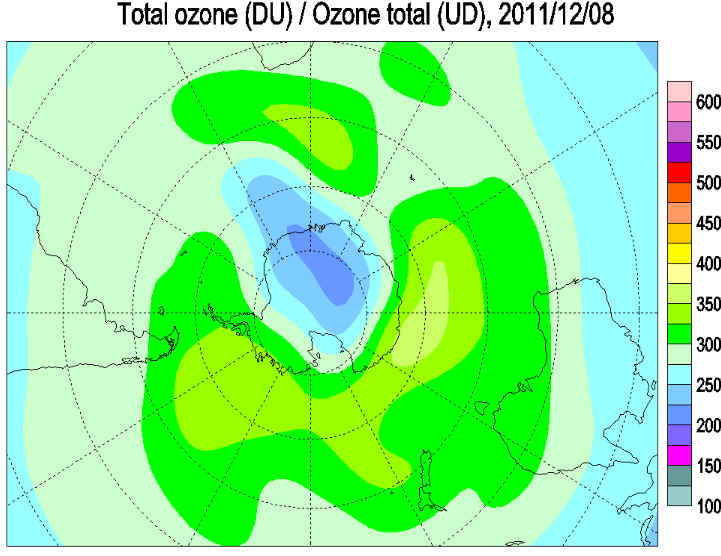 The 2011 Antarctic ozone hole is nearly over, with the remnant area of low ozone centred over Princess Elizabeth Land. Minimum values within the polar vortex are around 210 DU. The hole began to form in mid August, and by mid September had reached an area of around 25 million square kilometres, larger than the average for the last decade and remained near this size into early October. It had shrunk to around 20 million square kilometres by mid October and remained a similar size till mid November, when it s size dropped rapidly and now covers a few million square kilometres. It will have filled by the summer solstice. Its size from October to mid November was near to or above the record area for the time of year. The hole became more elliptical in mid October and the edge of the ozone hole passed over the tip of South America and the Falkland Islands, but then returned to a more circular form. The circum-polar ozone belt outside the vortex has some areas near 350 DU, but maximum levels are subsiding from peaks above 400 DU. The lower stratospheric temperature is well past its winter minimum, and warming is well under way, though temperatures remain substantially below the normal for this time of year. All of the Antarctic ozone layer is now above the polar stratospheric cloud formation temperature. The edge of the ozone hole passed over the tip of South America around September 26 to 28, October 9, 16 to 19. The edge again passed over this area from November 7 to 8. Significant differences between the various satellite analyses of ozone distribution remain. 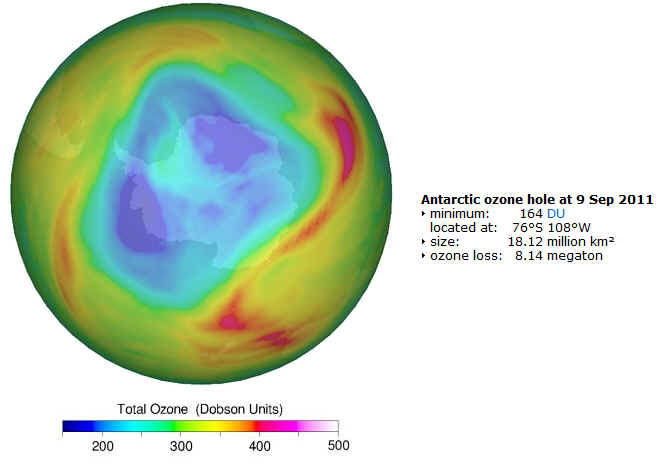 The Antarctic ozone hole is centred over the eastern Weddell Sea and is slowly filling. Minimum values within the polar vortex are around 200 DU. The 2011 hole is predicted to be over by mid December. The hole began to form in mid August, and by mid September had reached an area of around 25 million square kilometres, larger than the average for the last decade and remained near this size into early October. It had shrunk to around 20 million square kilometres by mid October and remained a similar size till mid November, when it dropped rapidly and is now around 5 million square kilometres. Its size from October to mid November was near to or above the record area for the time of year. The hole became more elliptical in mid October and the edge of the ozone hole passed over the tip of South America and the Falkland Islands, but then returned to a more circular form. The circum-polar ozone belt outside the vortex has some areas near 350 DU, particularly between the continent and Australia, but maximum levels are subsiding from peaks above 400 DU. The lower stratospheric temperature is well past its winter minimum, and warming is under way, though temperatures remain substantially below the normal for this time of year. 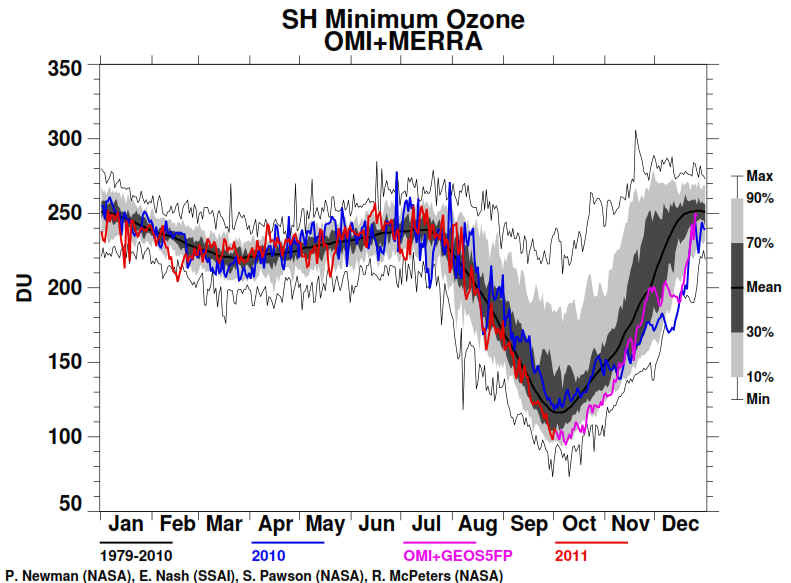 All of the Antarctic ozone layer is now above the polar stratospheric cloud formation temperature. The edge of the ozone hole passed over the tip of South America around September 26 to 28, October 9, 16 to 19. The edge again passed over this area from November 7 to 8. Significant differences between the various satellite analyses of ozone distribution remain. 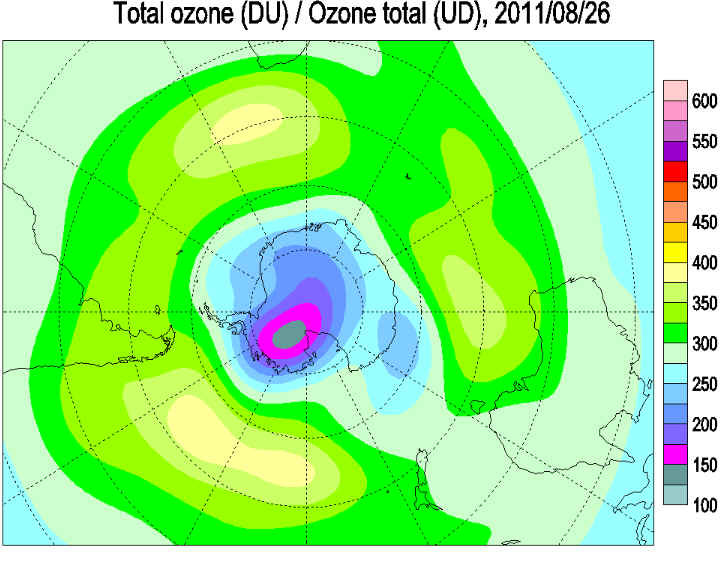 The Antarctic ozone hole is now centred over the eastern Weddell Sea and is slowly filling. The hole began to form in mid August, and by mid September had reached an area of around 25 million square kilometres, larger than the average for the last decade and remained near this size into early October. It had shrunk to around 20 million square kilometres by mid October and remained a similar size till mid November, when it dropped to around 14 million square kilometres. Its size during October and November has been near to or above the record area for the time of year. Ozone depleted air remains over Antarctica and the Weddell Sea, but the ozone hole is now filling. Minimum values within the polar vortex are around 200 DU. The hole became more elliptical in mid October and the edge of the ozone hole passed over the tip of South America and the Falkland Islands, but then returned to a more circular form. The circum-polar ozone belt outside the vortex has some areas near 370 DU, particularly between the continent and Australia, but maximum levels are subsiding from peaks above 400 DU. The lower stratospheric temperature is well past its winter minimum, and warming is under way, though temperatures remain substantially below the normal for this time of year. All of the Antarctic ozone layer is now above the polar stratospheric cloud formation temperature, though clouds can still exist. The edge of the ozone hole passed over the tip of South America around September 26 to 28, October 9, 16 to 19. Significant differences between the various satellite analyses of ozone distribution remain. 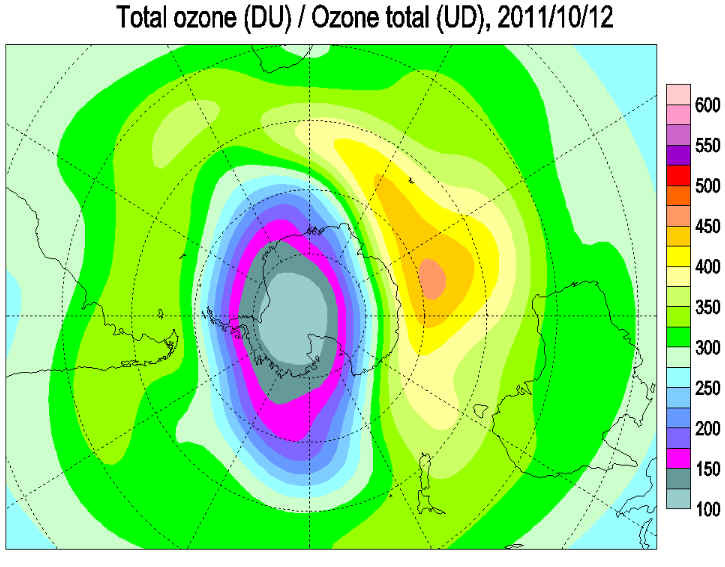 The Antarctic ozone hole is now centered off the coast of the Antarctic Peninsula and is slowly filling. The hole began to form in mid August, and by mid September had reached an area of around 25 million square kilometres, larger than the average for the last decade and remained near this size into early October. It had shrunk to around 20 million square kilometres by mid October and remained a similar size till mid November, when it dropped to around 14 million square kilometres. Its size during October and November has been near to or above the record area for the time of year. 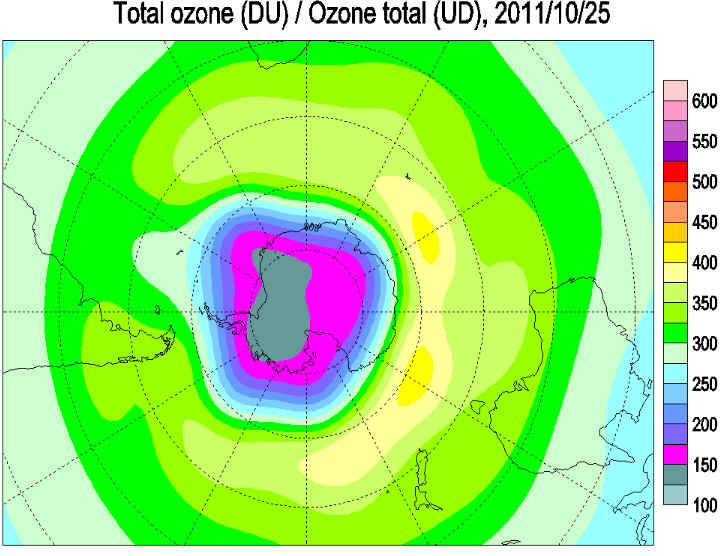 Ozone depleted air remains over Antarctica and the Weddell Sea, but the ozone hole is now filling. Minimum values within the polar vortex are around 180 DU. The hole became more elliptical in mid October and the edge of the ozone hole passed over the tip of South America and the Falkland Islands, but then returned to a more circular form. The circum-polar ozone belt outside the vortex has some areas near 370 DU, particularly between the continent and Australia, but maximum levels are subsiding from peaks above 400 DU. The lower stratospheric temperature is well past its winter minimum, and warming is under way, though temperatures remain substantially below the normal for this time of year. All of the Antarctic ozone layer is now above the polar stratospheric cloud formation temperature, though clouds can still exist. The edge of the ozone hole passed over the tip of South America around September 26 to 28, October 9, 16 to 19. The edge is again expected to pass over this area from November 7 to 8. Significant differences between the various satellite analyses of ozone distribution remain. The ozone hole began to form in mid August, and by mid September had reached an area of around 25 million square kilometres, larger than the average for the last decade. It remained near this size into early October, but had shrunk to around 20 million square kilometres by mid October. Its size during October has been near to the record area for this time of year and by the end of the month it was a record size for the time of year. It remained at around 19 million square kilometres in mid November. 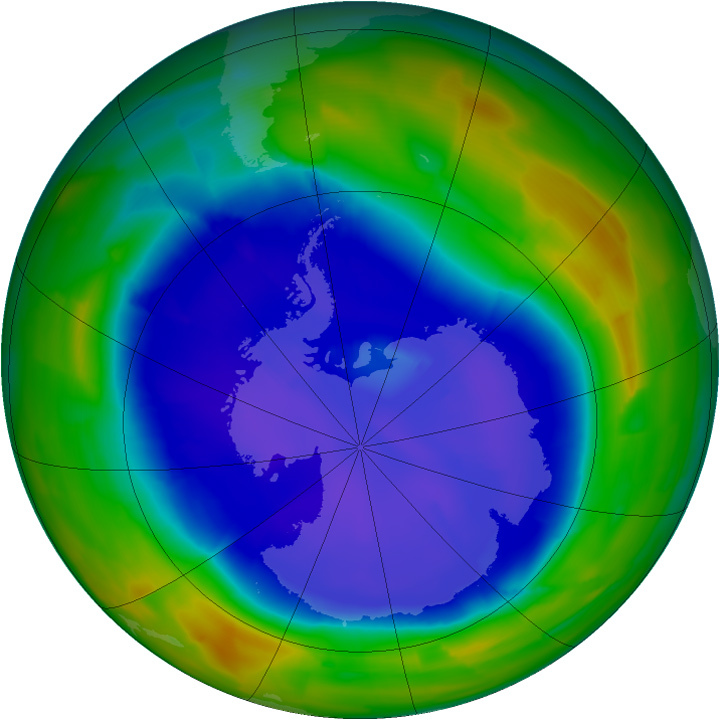 Ozone depletion remains widespread over Antarctica with much of the continent under the ozone hole, which is now filling. Minimum values within the polar vortex are around 150 DU. The hole became more elliptical in mid October and the edge of the ozone hole passed over the tip of South America and the Falkland Islands, but then returned to a more circular form. The circum-polar ozone belt outside the vortex has some areas near 400 DU, particularly between the continent and Australia, but maximum levels are subsiding. The lower stratospheric temperature is past its winter minimum, and warming is generally under way, but it is significantly below the normal for this time of year. All of the Antarctic ozone layer is now above the polar stratospheric cloud formation temperature, though clouds can still exist. The edge of the ozone hole passed over the tip of South America around September 26 to 28, October 9, 16 to 19. The edge is again expected to pass over this area from November 7 to 8. Significant differences between the various satellite analyses of ozone distribution remain. The ozone hole began to form in mid August, and by mid September had reached an area of around 25 million square kilometres, larger than the average for the last decade. It remained near this size into early October, but had shrunk to around 20 million square kilometres by mid October. Its size during October has been near to the record area for this time of year and by the end of the month it was a record size for the time of year. It remained at around 20 million square kilometres in early November. Ozone depletion remains widespread over Antarctica with much of the continent under the ozone hole. Minimum values within the polar vortex are below 150 DU. The hole became more elliptical in mid October and the edge of the ozone hole passed over the tip of South America and the Falkland Islands, but then returned to a more circular form. The circum-polar ozone belt outside the vortex has some areas near 400 DU, particularly between the continent and Australia, but maximum levels are subsiding. The lower stratospheric temperature is past its winter minimum, and warming is generally under way, but some of the Antarctic ozone layer remains below the polar stratospheric cloud formation temperature, and significantly below the normal for this time of year. The temperature at 30 hPa and higher is now above the PSC formation temperature. The edge of the ozone hole passed over the tip of South America around September 26 to 28, October 9, 16 to 19. The edge is again expected to pass over this area from November 7 to 8. Significant differences between the various satellite analyses of ozone distribution remain. The ozone hole began to form in mid August, and by mid September had reached an area of around 25 million square kilometres, larger than the average for the last decade. It remained near this size into early October, but had shrunk to around 20 million square kilometres by mid October. Its size during October has been near to the record area for this time of year and by the end of the month it was a record size for the time of year. Ozone depletion remains widespread over Antarctica with much of the continent under the ozone hole. Minimum values within the polar vortex are below 150 DU. The hole became more elliptical in mid October and the edge of the ozone hole passed over the tip of South America and the Falkland Islands, but is now returning to a more circular form. The circum-polar ozone belt outside the vortex has some areas near 400 DU, particularly between the continent and Australia, but maximum levels are subsiding. The lower stratospheric temperature is past its winter minimum, but much of the Antarctic ozone layer remains well below the polar stratospheric cloud formation temperature, and below the normal for this time of year. The temperature at 10 hPa and higher is now above the PSC formation temperature. The edge of the ozone hole passed over the tip of South America around September 26 to 28, October 9, 16 to 19. The ozone hole began to form in mid August, and by mid September had reached an area of around 25 million square kilometres, larger than the average for the last decade. It remained near this size into early October, but has now shrunk to around 20 million square kilometres. Its size during October has been near to the record area for this time of year. Ozone depletion remains widespread over Antarctica with much of the continent under the ozone hole. Minimum values within the polar vortex are below 140 DU. The hole became more elliptical in mid October and the edge of the ozone hole passed over the tip of South America and the Falkland Islands, but is now returning to a more circular form. The circum-polar ozone belt outside the vortex has some areas above 400 DU, particularly between the continent and Australia and south of Kerguelen. The lower stratospheric temperature is past its winter minimum, but much of the Antarctic ozone layer remains below the polar stratospheric cloud formation temperature, and below the normal for this time of year. The temperature at 10 hPa and higher is now above the PSC formation temperature. The edge of the ozone hole passed over the tip of South America around September 26 to 28, October 9, 16 to 19. The ozone hole began to form in mid August, and by mid September had reached an area of around 25 million square kilometres, larger than the average for the last decade. It remained near this size into mid October, with a near record area for this time of year, but is now shrinking and covers 21 million square kilometres. Ozone depletion remains widespread over Antarctica with much of the continent under the ozone hole. Minimum values within the polar vortex are below 140 DU. The hole has become more elliptical and the edge of the ozone hole is predicted to pass over the tip of South America and the Falkland Islands over the next few days. The circum-polar ozone belt outside the vortex has some areas above 400 DU, particularly between the continent and Australia. The lower stratospheric temperature is past its winter minimum, though some of the Antarctic ozone layer remains below the polar stratospheric cloud formation temperature. The lower stratospheric temperature is below the normal for this time of year. The edge of the ozone hole passed over the tip of South America around September 26 to 28. At 25 million square kilometers (about 9.7 million square miles), the ozone hole over the South Pole reached its maximum annual size on September 14, 2011. This year’s hole was the 5th largest on record, as documented by the SBUV/2 sensor on board the NOAA POES spacecrafts. 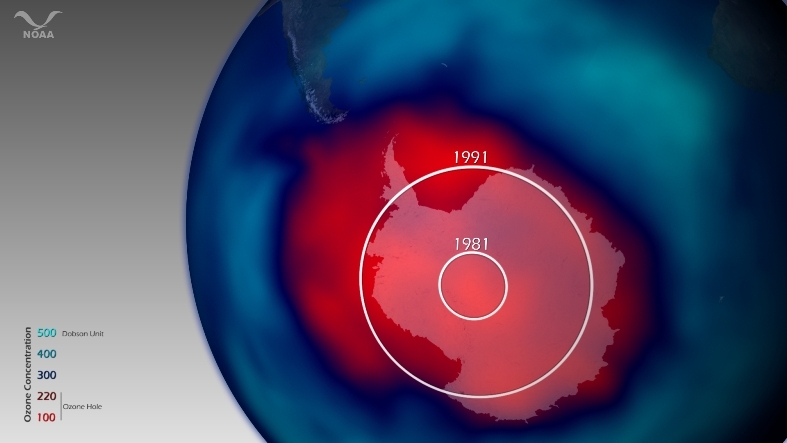 Since its discovery in the late 1970’s with the first satellite mission that could measure ozone, the hole continued to grow in its annual maximum area steadily throughout the 1980’s and 90’s. Since the early 2000’s, the growth has leveled off, but there is still large variability from year to year. The international banning of ozone-destroying oxidizing chemicals like CFC’s (chlorofluorocarbons) has helped reduce the loss of ozone, which protects Earth from harmful ultraviolet energy from the sun. As these ozone-destroying compounds slowly break down in the stratosphere, years with large ozone holes are now more associated with very cold winters over Antarctica and high polar winds that prevent the mixing of ozone rich air outside of the polar circulation with the ozone depleted air inside. 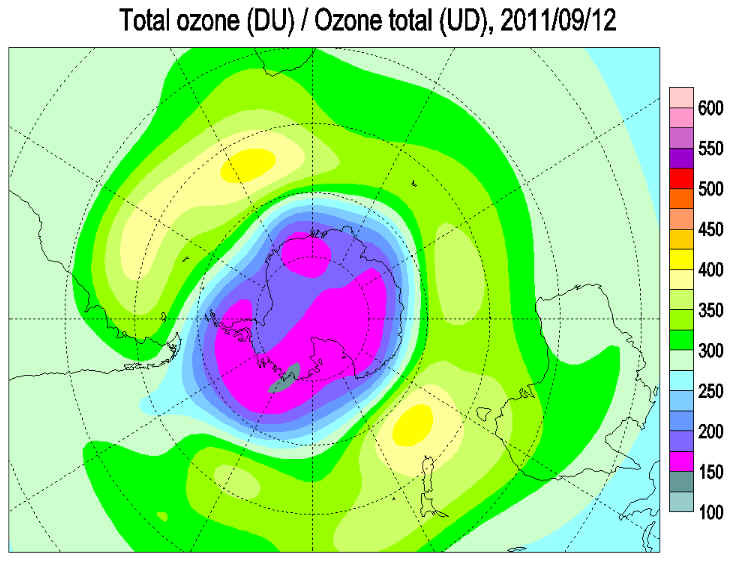 Shown here is the total ozone concentration over the South Pole on September 14, 2011. The “hole” is designated as the area where the total ozone concentration is below 220 Dobson units (a measure of thickness). In this image, those values are colored red. To put the 2011 maximum ozone hole size in context with that of past decades, the approximate size of 1981 and 1991 maximum hole areas are also shown. The ozone "hole" is not a complete depletion of ozone throughout the entire atmosphere, but rather the partial or complete depletion of ozone between 14-22 km above the surface. On October 27, 2011, the NASA NPP satellite will launch, bringing with it continued observations of the ozone layer with the Ozone Mapper Profiler Suite. The advanced sensors on OMPS will be used by NOAA to provide more accurate measurements of the total area of the ozone hole while also measuring how the concentration of ozone changes vertically throughout the atmosphere. 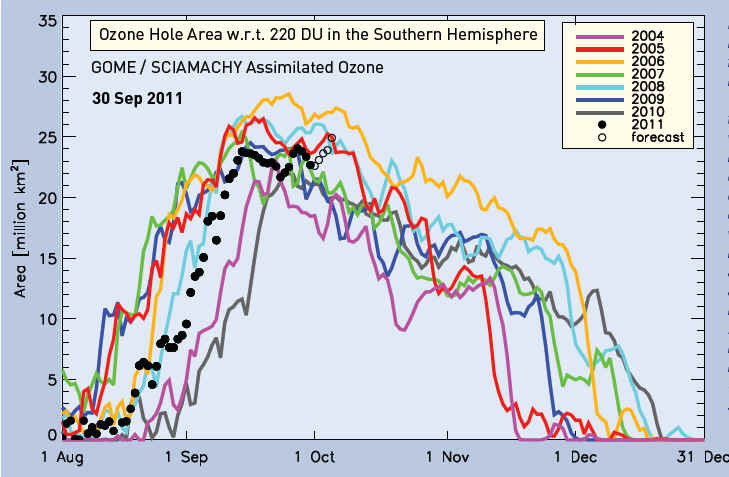 Satellite observations show that the area where total ozone is less than 220 DU (“ozone hole area”) is average compared to recent years. 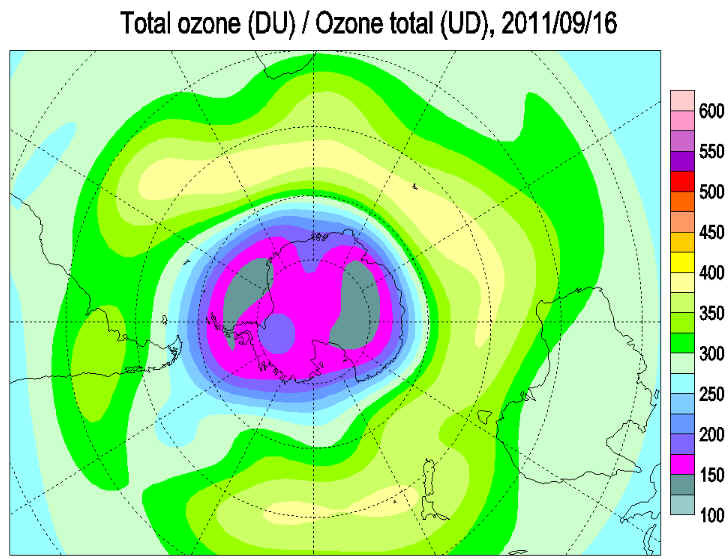 In late September, the ozone hole area is smaller than the ozone hole of 2008 but larger than in 2009 and 2010. The sun has now returned to all of Antarctica after the polar night, and ozone destruction is now slowing down compared to two weeks ago. The area of the ozone hole is now near or at its maximum for the season, whereas the ozone mass deficit might continue to increase for another week or so. The development of ozone depletion so far in combination with the temperature conditions and the extent of polar stratospheric clouds indicate that the degree of ozone loss will be about average in comparison to the ozone holes of the last decade. However, the relatively large amounts of active chlorine could lead to a somewhat prolonged period of ozone loss compared recent years. 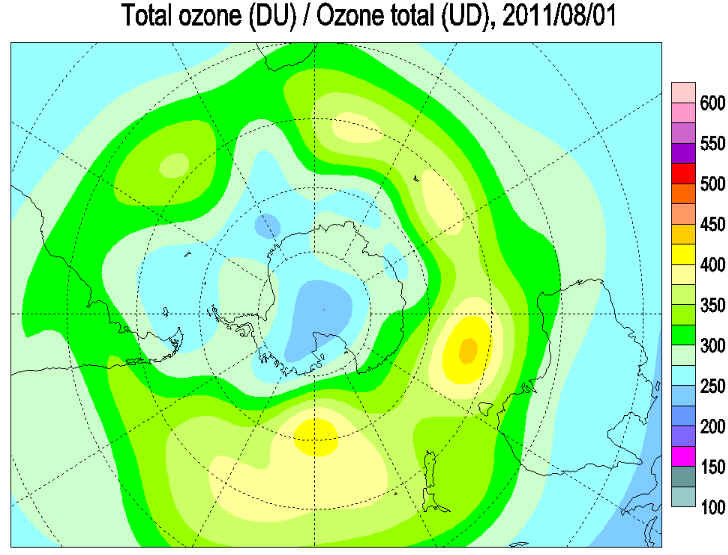 The ozone hole area for the years from 2004 to 2011. 2011 is shown with black dots. The ozone hole area is the area of the region where total ozone is below 220 DU. The open circles represent a forecast for the five next days. 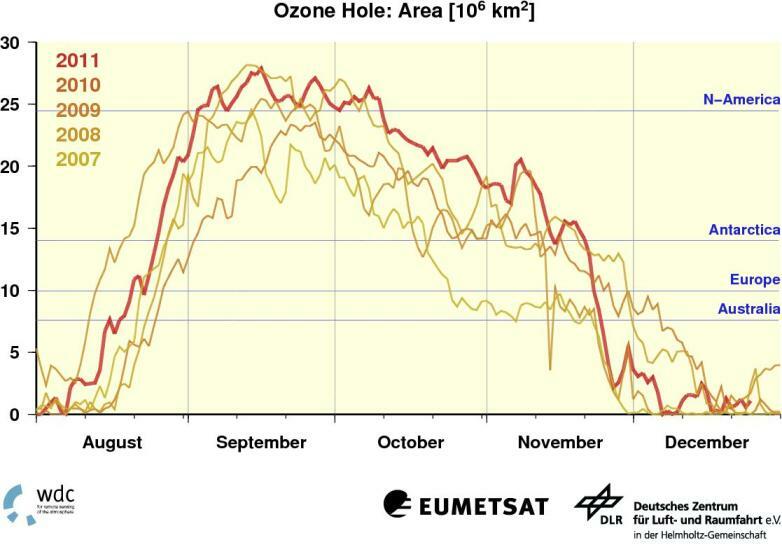 During the two weeks since the last Bulletin, which showed data as of 1 September, the area of the ozone hole has increased from 10 to 24 million km2. This plot is produced by KNMI and is based on data from the GOME and SCIAMACHY satellite instruments. The ozone hole began to form in mid August, and by mid September had reached an area of around 24 million square kilometres, larger than the average for the last decade. It remains near this size. Ozone depletion is now widespread over Antarctica with much of the continent under the ozone hole. Minimum values within the polar vortex are below 120 DU. The circum-polar ozone belt outside the vortex has some areas above 400 DU. The lower stratospheric temperature is near its winter minimum, with much of the Antarctic ozone layer below the polar stratospheric cloud formation temperature. The lower stratospheric temperature is below the normal for this time of year. The ozone hole began to form in mid August, and by mid September had reached an area of 25 million square kilometres, larger than the average for the last decade. Ozone depletion is now widespread over Antarctica with much of the continent under the ozone hole. Minimum values within the polar vortex are below 130 DU. The circum-polar ozone belt outside the vortex has some areas above 400 DU. The lower stratospheric temperature is near its winter minimum, with much of the Antarctic ozone layer below the polar stratospheric cloud formation temperature. The lower stratospheric temperature is below the normal for this time of year. 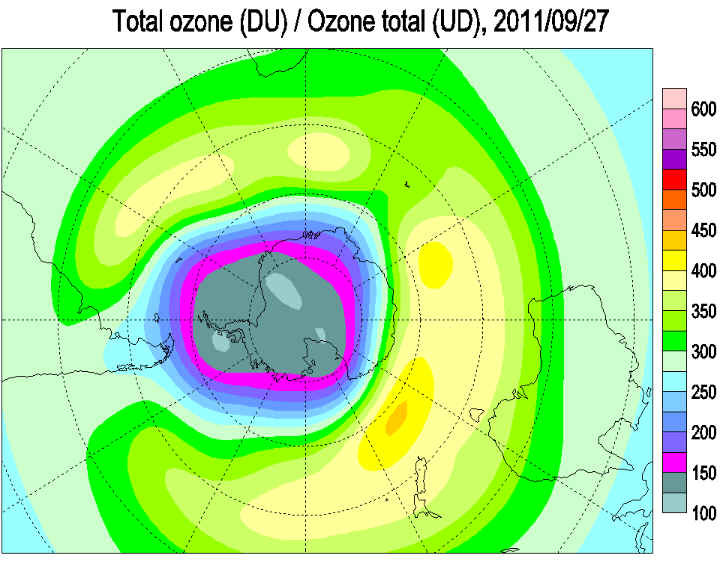 The edge of the ozone hole is expected to pass over the tip of South America around September 26 to 28. 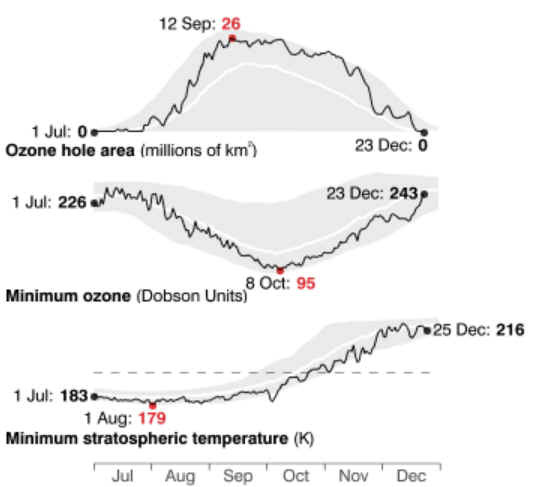 The ozone hole began to form in mid August, and by mid September had reached an area of 25 million square kilometres, larger than the average for the last decade. Ozone depletion is now widespread over Antarctica with much of the continent under the ozone hole. Minimum values within the polar vortex are below 160 DU. The circum-polar ozone belt outside the vortex has some areas above 400 DU. The lower stratospheric temperature is near its winter minimum, with much of the Antarctic ozone layer below the polar stratospheric cloud formation temperature. The lower stratospheric temperature is below the normal for this time of year. The ozone hole began to form in mid August, and by early September had reached an area of 22 million square kilometres, a little larger than the average for the last decade. Ozone depletion is now widespread over Antarctica. Minimum values within the polar vortex are below 200 DU. The circum-polar ozone belt outside the vortex is intensifying, with some areas above 400 DU. The lower stratospheric temperature is near its winter minimum, with much of the Antarctic ozone layer below the polar stratospheric cloud formation temperature. This temperature is below the normal for this time of year. 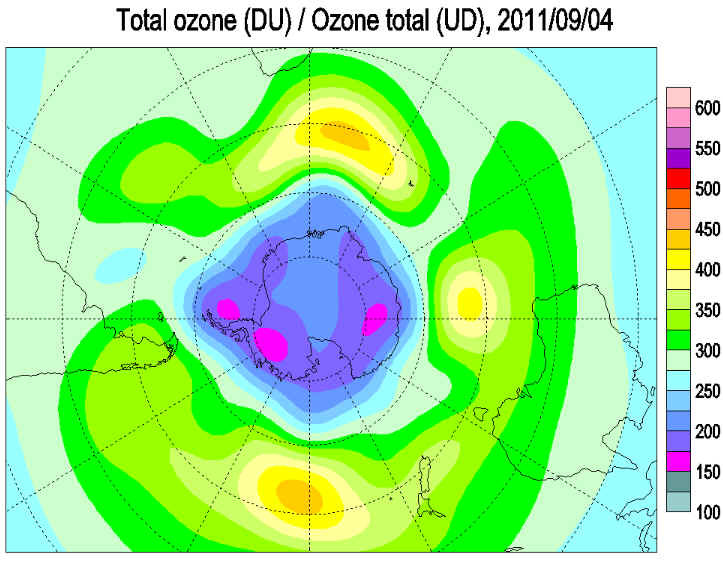 Situation at 2011 September 5 British Antarctic Survey Ozone Bulletin Ozone depletion is now widespread over Antarctica. Minimum values within the polar vortex are below 200 DU. The circum-polar ozone belt outside the vortex is intensifying, with some areas above 400 DU. The lower stratospheric temperature is near its winter minimum, with much of the Antarctic ozone layer below the polar stratospheric cloud formation temperature. This temperature is below the normal for this time of year. The daily minimum temperatures at the 50 hPa level and south of 50°S have been below the 1979-2010 average since April. The average temperature over the 60-90°S region was quite close to or below the long-term mean until the middle of July. A minor warming event in the middle of July led to temperatures rising above the long-term mean for some days. During August the 60-90°S mean temperature has decreased and is now well below the long term average. Since the onset of NAT temperatures on 10 May the NAT area has been above the 1979-2010 average during the whole winter. The NAT area reached peaks above 27 million km2 on a couple of occasions in August. The longitudinally averaged heat flux between 45°S and 75°S is an indication of how much the stratosphere is disturbed. From April to early July the 45-day mean of the heat flux was lower than or close to the 1979-2010 average. In early July, the heat flux increased somewhat in conjunction with the minor stratospheric warming event and remained larger than the 1979-2010 average until early August. The last few days the heat flux has been smaller than the long-term average. This means that the vortex has been relatively stable so far this year and more stable than in 2010. At the altitude of ~18 km the vortex is now almost entirely depleted of hydrochloric acid (HCl), one of the reservoir gases that can be transformed to active chlorine. The polar vortex was somewhat less depleted of HCl in 2008 and 2010, as compared to 2009 and 2011. The area affected by HCl removal is somewhat larger in 2011 than in the previous years. In the sunlit collar along the vortex edge there are regions with 1.5-1.8 ppbv of active chlorine (chlorine monoxide, ClO), and ozone depletion has just started. The maximum mixing ratio of ClO is somewhat lower than in 2008 and 2009 but larger than in 2010 at the same date. 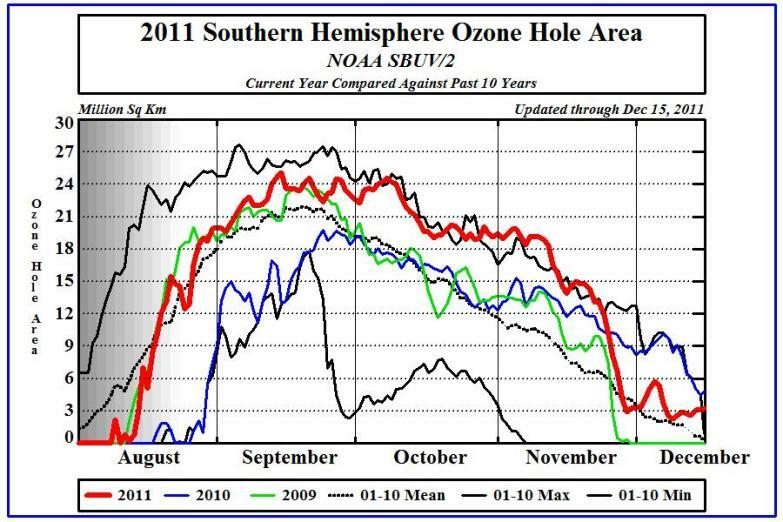 Satellite observations show that the area where total ozone is less than 220 DU ("ozone hole area") is normal compared to recent years. 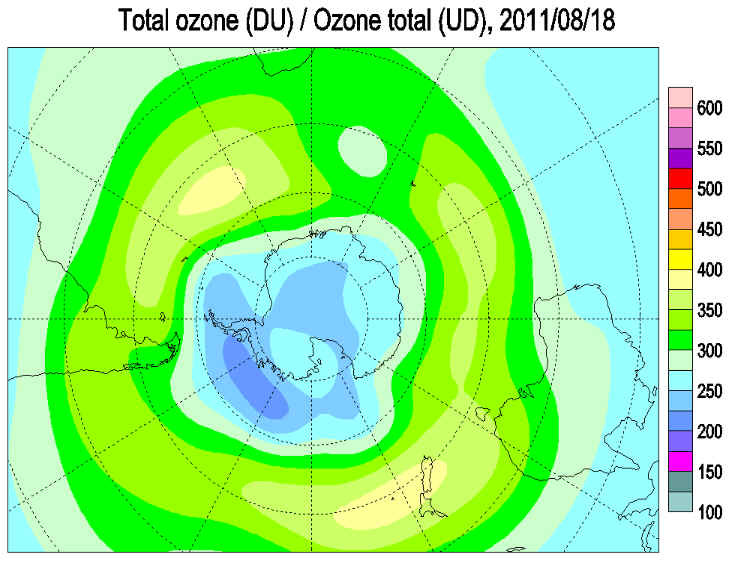 In mid-August, the ozone hole area is larger than in 2008 and 2010 but smaller than in 2009. However, the onset of ozone depletion varies considerably from one year to the next, depending on the position of the polar vortex and availability of daylight after the polar night. Measurements with ground based instruments and with balloon sondes show first signs of ozone depletion at some sites located close to the vortex edge. In this issue data are reported from the following stations: Arrival Heights, Dôme Concordia, Dumont d'Urville, Marambio, Neumayer, Rothera, Syowa and Vernadsky. As the sun returns to Antarctica after the polar night, it is expected that ozone destruction will speed up. 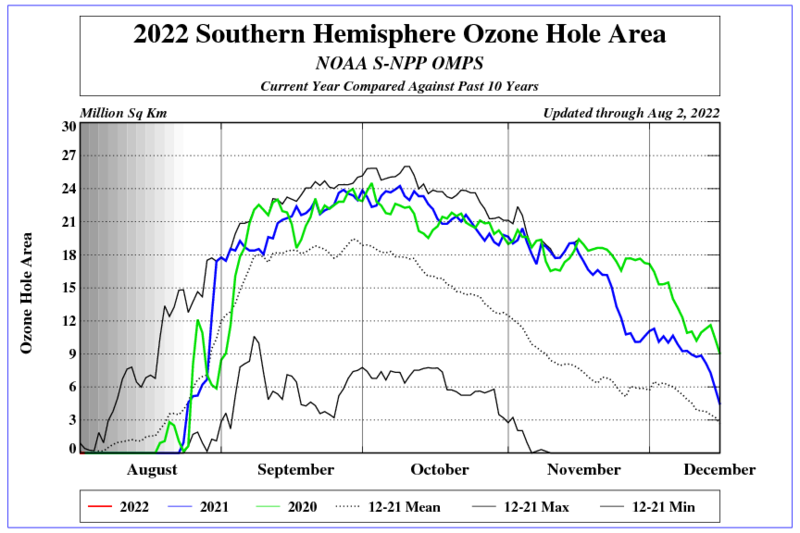 It is still too early to give a definitive statement about the development of this year's ozone hole and the degree of ozone loss that will occur. This will, to a large extent, depend on the meteorological conditions. However, the temperature conditions and the extent of polar stratospheric clouds so far this year indicate that the degree of ozone loss will be about average in comparison to the ozone holes of the last decade. WMO and the scientific community will use ozone observations from the ground, from balloons and from satellites together with meteorological data to keep a close eye on the development during the coming weeks and months. 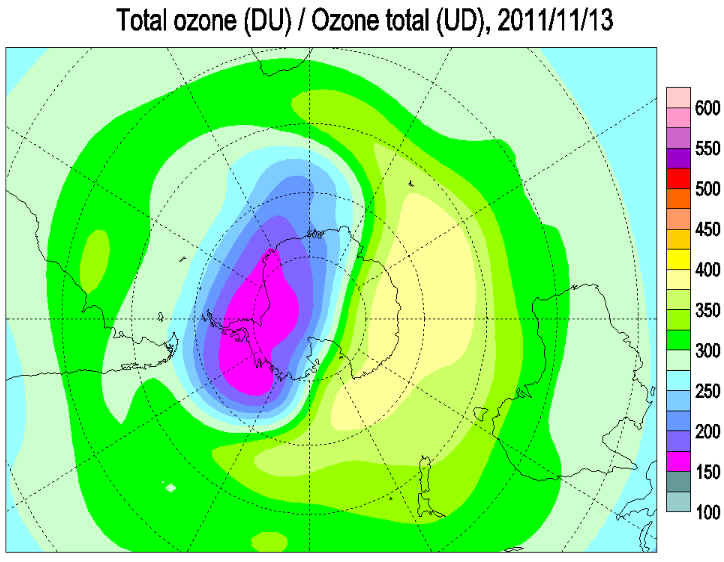 Ozone depletion is now becoming widespread over Antarctica. Minimum values within the polar vortex are probably below 200 DU, though this is not well reflected in the satellite analyses. The circum-polar ozone belt outside the vortex is intensifying, with some areas above 400 DU. The lower stratospheric temperature is nearing its winter minimum, with much of the Antarctic ozone layer below the polar stratospheric cloud formation temperature. This temperature is below the normal for this time of year. Ozone depletion is now taking place over Antarctica. Minimum values within the polar vortex are below 240 DU. The circum-polar ozone belt outside the vortex is intensifying, with some areas above 430 DU. The lower stratospheric temperature is nearing its winter minimum, with much of the Antarctic ozone layer below the polar stratospheric cloud formation temperature. This temperature is a little below the normal for this time of year.